Jan Grabowski, a University of Ottawa professor who is a leading scholar of the Holocaust, delivered the annual Rudolf Vrba Memorial Lecture at the University of British Columbia Nov. 15 – the same day he filed a libel suit against an organization aligned with Poland’s far-right government. The Polish League Against Defamation, which is allied with the country’s governing Law and Justice Party, initiated a campaign against Grabowski last year, accusing him of ignoring the number of Poles who saved Jews and exaggerating the number of Jews killed by their Polish compatriots. 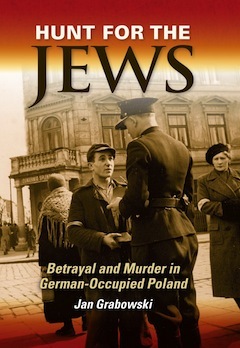 Grabowski’s book, Hunt for the Jews: Betrayal and Murder in German-Occupied Poland, won the 2014 Yad Vashem International Book Prize for Holocaust Research. An English translation of an even more compendious multi-year analysis undertaken by a team of researchers under Grabowski’s leadership will be published next year. His Vrba lecture provided an overview of some of the findings in the new work. It is a harrowing survey that brought condemnation from Polish-Canadians in the Vancouver audience. The new book, which does not yet have an English title, is a work of “microhistory,” Grabowski said. Holocaust studies is one of the fastest-growing fields of historical research, he said, partly because it got off to a slow start and really only picked up in the 1980s. Much of the written work being completed today is in the area of survivor memoirs, second- and third-generation experiences, including inherited trauma, and “meta-history,” the study of the study of the Holocaust. Jewish neighbours. By combing through these previously ignored records, Grabowski and his co-authors have amassed evidence of widespread – and eager – involvement of Polish police and other Poles in assisting Germans to identify, hunt down and murder Polish Jews. The work has been met with official condemnation. Earlier this year, the Polish government adopted a law that would expose scholars involved in the study of the Holocaust to fines and prison terms of up to three years. The criminal component of the law, including imprisonment, was rescinded after international backlash, but the atmosphere around Holocaust inquiry in Poland remains repressive. Grabowski said that the “explosion of right-wing extremists, xenophobia and blatant antisemitism” in Poland is related to the “undigested, unlearned and/or rejected legacy of the Holocaust” – the fact that Polish society has, by and large, refused to acknowledge the wounds of the past or to deal with its own role in the extermination of three million of its Jewish citizens between 1939 to 1945. The concept of microhistory, which is the approach Grabowski’s team uses, is not local history, he said, “it is an attempt to follow trajectories of people.” He instructed his researchers to focus on the exact day, often hour by hour, when liquidation actions took place in hundreds of Polish shtetls and ghettoes. To do so upends a conspiracy of silence that has existed for decades. The communist regime that dominated Poland for a half-century after the war was viewed not only as a foreign power inflicted on Poles from the Soviet Union, Grabowski said, “but, more importantly, as Jewish lackeys – that was a term that was used. The third factor in the silence were the interests of Polish nationalists, whose ideology is inherently antisemitic, and who are the dominant political force in the country today. Hunt for the Jews won the 2014 Yad Vashem International Book Prize for Holocaust Research. While clearly not all Poles were collaborators, it would have been impossible for almost anyone in the country to claim ignorance of what was happening. “Mass killing was taking place in the streets,” the professor said. Researchers found bills of sale charging city officials for the sand municipal workers needed to cover the blood on sidewalks. “When you say that blood was running in the streets, it’s not a metaphor, it’s just a description of what really happened,” he said. In some ghettos, as many as half the Jewish population was killed on the day of the action, with massive participation from Polish society. “One area more, one area less,” he said. “Usually between 10 and 20% of Jews were slaughtered simply in order to frighten the remaining 80% to go to the trains, to be herded to the trains,” said Grabowski. In Poland’s smaller communities, centuries of Jewish and Polish social, commercial and civic interactions did not result in camaraderie – on the contrary. “The deadliest places of all [were] small shtetls, small towns, where anonymity was not available when the authorities were not far away,” he said. In one instance, a Jew in hiding heard his neighbour assure the Nazis he would return with a hatchet to help them break into the hiding place seconds before the door was axed down. Rumours of liquidation swirled for months, as Jews fleeing neighbouring communities brought narratives of destruction. In the day or two before the liquidation, wives of Polish military and other officials rushed to their Jewish tailors, shoemakers and others craftspeople to obtain the items they knew would soon become unavailable. On the eve of Yom Kippur in 1942, Polish officials in the town were instructed to assemble horses, wagons and volunteers. A cordon of Nazis and collaborators surrounded the city at intervals of no more than 100 metres. The mayor of the town wrote: “Jews who woke up to the terrible news ran like mad around the city, half-naked, looking for shelter.” The same leader noted that, when the Germans demanded he produce volunteers to help with the task of rounding up their Jewish neighbours, he feared he would not be able to meet their needs. For Jews, the Germans were to be feared, but their Polish neighbours were also a threat. Poles were rewarded with a quarter-kilo of sugar for every Jew they turned in. “The searches were conducted with extreme brutality and violence … the streets were soon filled with crowds of Jews being driven toward the market square, which the Germans had transformed into a holding pen for thousands of ghetto inmates,” he said. On the streets, “the cries of Jews mixed with the shouts of the Germans and the laughter of the Poles,” according to an eyewitness. People were taking clothes, jewelry and other possessions from the dead bodies. A husband would toss a body in the air while the wife pulled off articles of clothing until what was left was a pile of naked cadavers. “They even pulled out golden teeth with pliers,” said Grabowski. A court clerk responded defensively to accusations that the gold he was trying to sell was soaked in human blood. “I personally washed the stuff,” he protested. The prevalence in the Polish imagination of a Jewish association with gold partly accounted for the actions. The historical records indicate many Poles saw no need to cover their collaborationist tracks. Police and others who took it upon themselves to aid the Nazis without pressure defended their actions. One policeman, after the war, depicted the killing of Jews as a patriotic act, one that saved Polish villagers from the wrath of the Nazis, who would have learned sooner or later about Jews in hiding and who then, he claimed, would have burned down the entire village. As efficient as the Nazi killing machine was, Grabowski contends it could not have been as effective without the enthusiastic complicity of so many in Poland and other occupied countries. “It was their participation that, in a variety of ways, made the German system of murder as efficient as it was,” he said. With trepidation, Grabowski and his fellow researchers followed the documents and met with people in the towns. They would review documents from a 1947 trial, for instance, then go to the village in question. The entire village would be conscious of its war-era history, he said. And the people who are, decades later, ostracized by their neighbours are not those who collaborated in the murder of Jews. “The person that is ostracized is the family who tried to rescue the Jews, because they broke a certain social taboo and it still visible 75 or 76 years after the fact,” he said. In the question-and-answer session, Grabowski shut down a persistent audience member who identified as Polish and who took exception with Grabowski’s research, arguing that Poland has more Righteous Among the Nations at Yad Vashem than any other country. While Poland’s far-right government removed the mandated jail sentence for anyone found guilty of “slandering” Poland or Poles with complicity in Nazi war crimes, acknowledging the participation of Polish collaborators in the Holocaust remains a civil offence and Holocaust scholars in the country – and in Canada – face death threats and intimidation. In introducing Grabowski, Richard Menkis, associate professor in the department of history at UBC, paid tribute to Rudolf Vrba, a Slovakian Jew who escaped Auschwitz and brought to the world inside information about the death camp, its operations and physical layout. Vrba, with fellow escapee Albert Wetzler, warned in 1944 that Hungarian Jews were about to face mass transport to the death camps. The news is credited with saving as many as 200,000 lives. Vrba migrated to Canada and became a professor of pharmacology at UBC. He died in 2006. The Vrba lecture alternates annually between an issue relevant to the Holocaust and an issue chosen by the pharmacology department in the faculty of medicine.